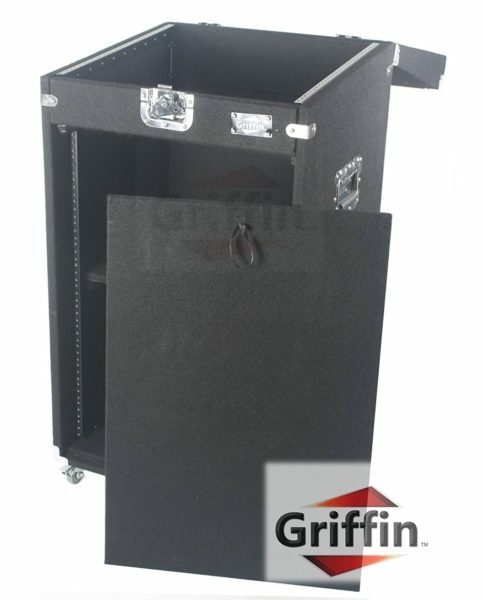 This is one of the best studio equipment rack mount road cases on the market! With spring loaded, recessed handles and reinforced, metal corners on the exterior, this rackmount studio road case is built to persevere the abuse and rigors of daily use. Black carpeting covers all the walls of the studio mixer rack case, and the side walls are ¾ inch thick. 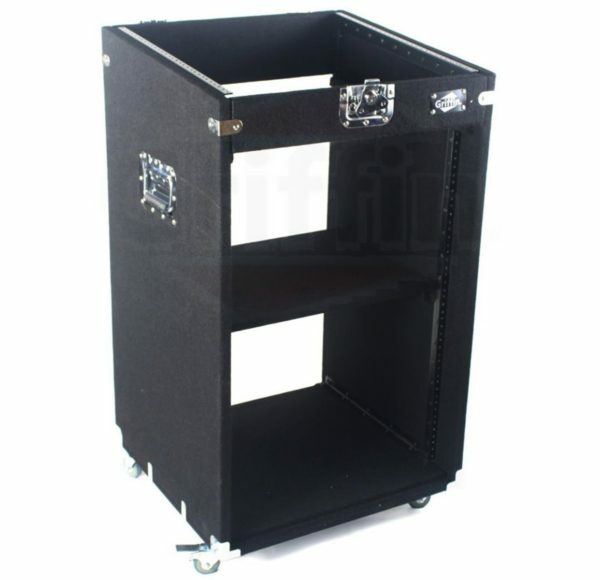 To provide ultimate access to your equipment, the lid, front panel, and back panel of this rack mount studio equipment road case are removable revealing ten (10) horizontal spaces on the top racks and fifteen (15) vertical spaces on the bottom racks, accommodating all standard 19 inch rack mountable gear. Located in the back panel is a cut-out to handle your equipment wires. This studio mixer rack road case includes rack rails. The mid shelf is also removable, if desired. To protect your equipment when you are not around, a lockable butterfly latch clip recessed in the front of this studio mixer rackmount stand with casters locks securely. Of course, you need this 25U rackmount road case to go places with you. 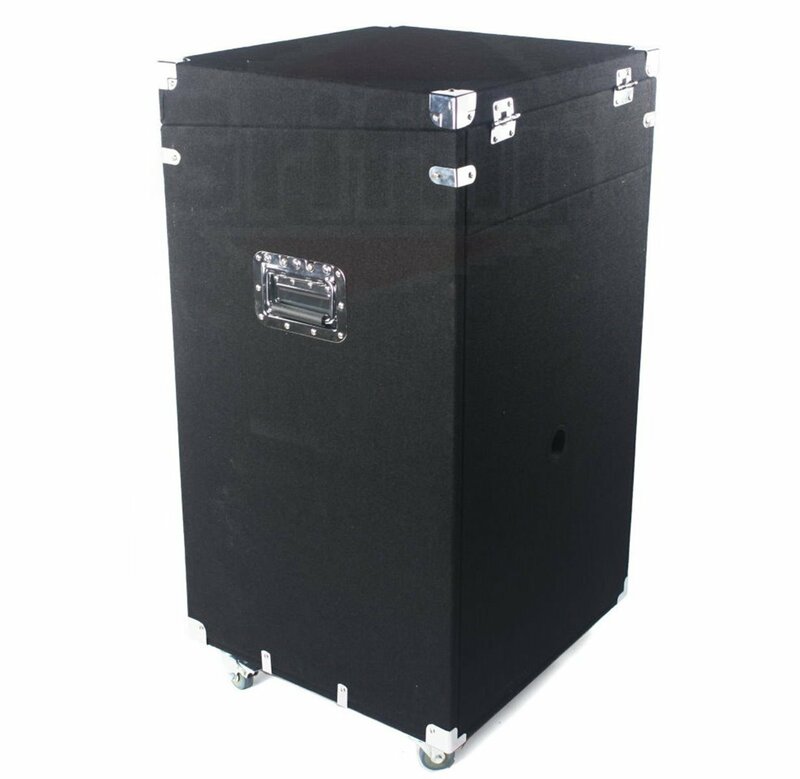 Four (4) heavy duty, steel and rubber casters support these DJ rackmount road cases as they roll from one position to another. Once the studio equipment rack stand on wheels is where you want it, two of the casters are lockable to keep the studio equipment rack mount cabinet from rolling somewhere else unintentionally. To save you money, we ship this 25U rackmount road case disassembled and flat to lower your shipping costs. 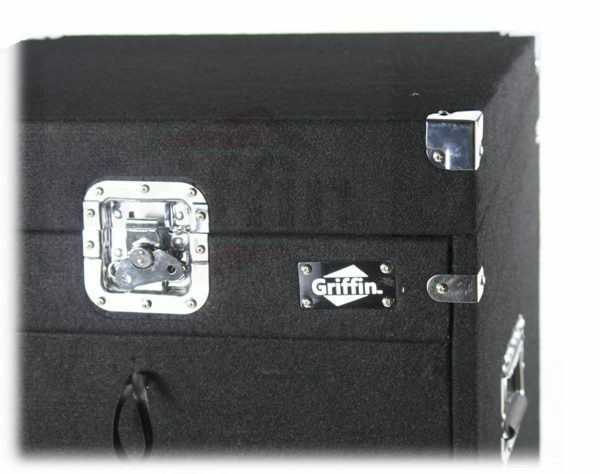 We professionally package your studio mixer rack road case with a double-box to prevent damages during shipping. Some assembly for the side walls, caster wheels, and corner guards is required. A power drill is the only tool required (not included). Instructions are included; total assembly time is approximately 30 minutes. 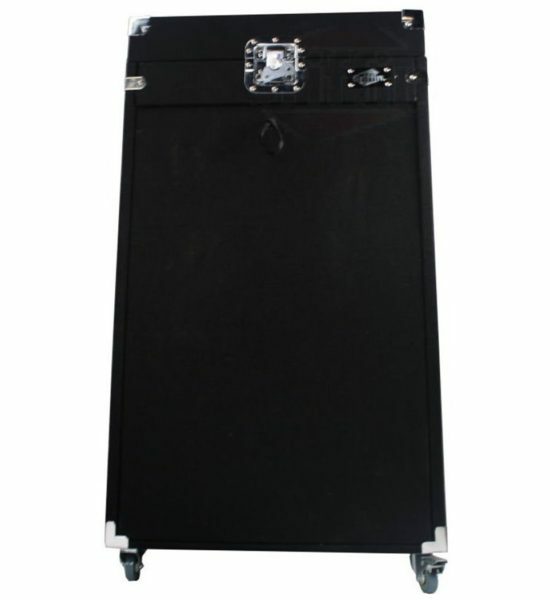 We encourage you to compare this 25U rackmount road case to other DJ rack mount road cases online. 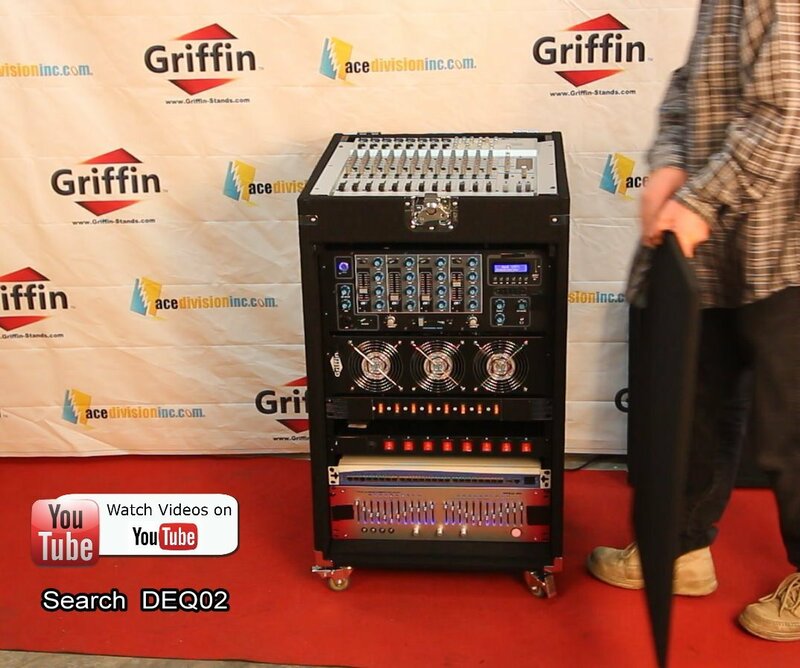 This mobile DJ rackmount case with casters is exceedingly sturdy and durable. 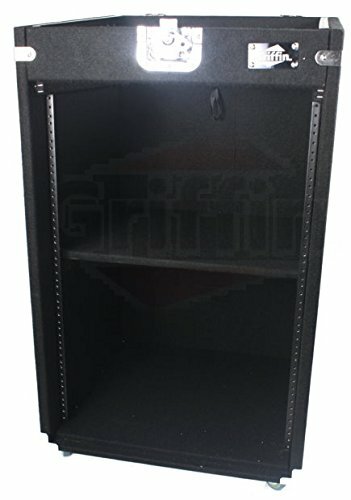 If you shop around, you will realize we offer the lowest price for quality studio equipment rack mount cabinets. Try finding another mobile DJ rackmount stand on wheels able to work this hard for you at such a cheap price; it cannot be done! 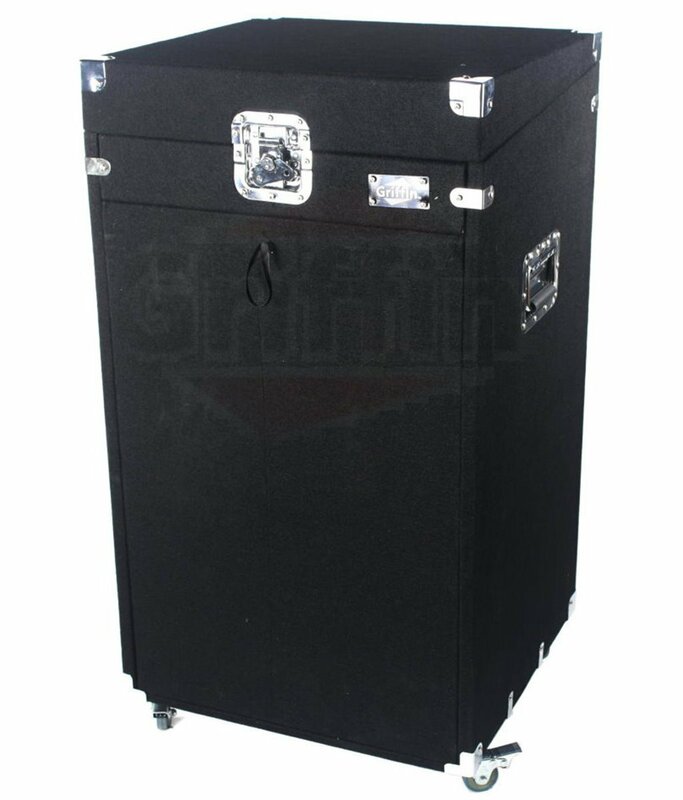 We offer the lowest price for quality rack mount studio equipment road cases. Although this rackmount studio road case is similar to a Gemini MRC-16 case, you may buy today with peace of mind knowing you are getting the lowest price possible for this high quality 25U rackmount road case. DISCOVER THE MOST RELIABLE & CONVENIENT STUDIO MIXER ROAD CASE – The Griffin premium rackmount studio mixer travel case is designed with your convenience and comfort in mind. Our designers have paid great attention to every detail, in order to make your life easier while on the road. Our elite rackmount case is perfect for accommodating all your audio equipment, while offering you a convenient and safe way to transport them from one venue to the other. HEAVY-DUTY CONSTRUCTION FOR MAXIMUM SECURITY – Rest assured that your expensive studio equipment is safe from possible damage, due to the durable and heavy-duty construction of our elite rackmount cabinet case. The outer corners are reinforced with high-quality steel while both the interior and the exterior are carpeted in order to withstand any abuse. 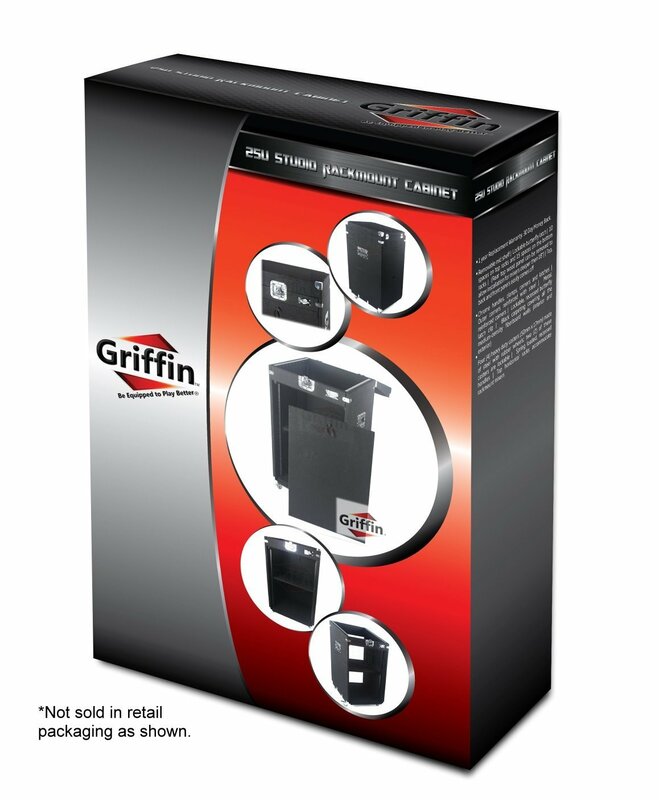 The ¾ inch thick side-walls will keep your equipment secure and your mind at ease! DESIGNED FOR THE MODERN BUSY DJ – Why settle for flimsy, low-quality alternatives, when the most durable and efficient rackmount studio mixer road case is finally available? You can have unlimited access to your equipment, since the top, back and front panels easily come off. In addition, the 4 sturdy steel casters with rubber wheels, 2 of which are lockable, will allow you to effortlessly transport your equipment. ENJOY A HASSLE-FREE EXPERIENCE – The Griffin premium rackmount road case is not only convenient and durable, but also extremely space-saving, since you can easily place all your devices on the racks. The top rack features 10 spaces, while the bottom rack features 15 spaces. Plus, the recessed chrome handles will eliminate any hassle. And if you want to store your equipment and leave, the chrome lockable butterfly latch will provide you with the extra security needed!  YOUR SATISFACTION IS OUR #1 PRIORITY – We, at Griffin, believe that you deserve the most durable and convenient professional audio storage accessories available. That’s why we confidently back our exclusive rackmount studio mixer road case with a 30-day refund and a premium 1-year full warranty! Can you really afford to miss out on this risk-free opportunity?